1. Stocks calm: Markets appear to have stabilized after a rough start to the week. 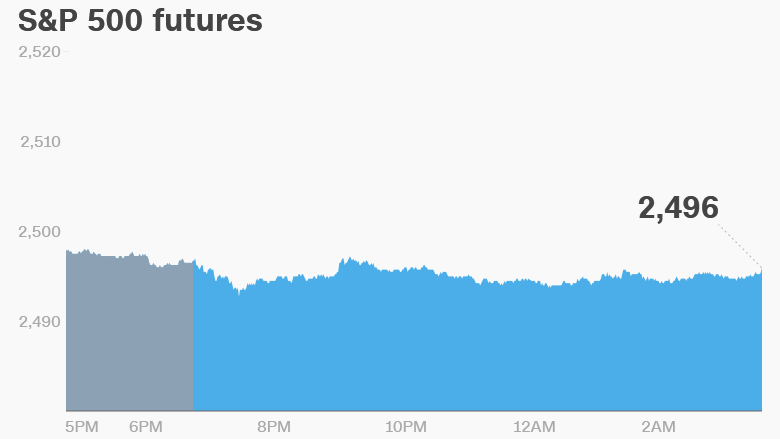 U.S. stock futures were flat on Tuesday. The Nasdaq declined by nearly 1% on Monday, while the Dow Jones industrial average and S&P 500 also slipped. "Demand for safe havens returned on Monday, as a new war of words between North Korea and the U.S. triggered a flight to safety amongst investors," said Hussein Sayed, chief market strategist at FXTM. "So far, every aggressive sell off in equities and move to safe havens on geopolitical risks, has proven to be short-lived." European stocks were mixed in early trading. Moves in Asian markets were muted. 2. Oil watch: U.S. crude futures are trading around $52 a barrel, up about 22% from their recent low of $42.53 in mid-June. Crude prices surged after Turkish President Recep Tayyip Erdogan threatened to shut down a pipeline that carries oil from the semi-autonomous Kurdish region in northern Iraq. Iraqi Kurds cast ballots in a controversial independence referendum Monday. Turkey, which has a sizable Kurdish minority, opposes the creation of an independent Kurdistan. 3. Ones to watch -- Boeing, Bombardier, SEC, France: The U.S. International Trade Commission, an arm of the Commerce Department, is expected to make the first of two rulings on a dispute between Boeing (BA) and Bombardier (BDRAF) on Tuesday. Boeing, America's largest exporter and sole U.S. producer of commercial airliners, is in the midst of suing Bombardier. At issue is whether funds Bombardier received from the Canadian government to stay afloat allowed the plane maker to sell jets for what Boeing alleges were "absurdly low prices." The head of the U.S. Securities and Exchange Commission, Jay Clayton, will testify before the Senate Banking Committee at 10 a.m. ET. Clayton has asked the agency's inspector general to investigate a cyberattack that infiltrated its electronic corporate filings system last year, according to prepared congressional testimony seen by CNNMoney. It's possible that hackers may have stolen information for use in illegal trades. French President Emmanuel Macron is speaking in Paris about his vision for Europe, along with his budget plans. But it's not clear that his potential negotiating partner, German Chancellor Angela Merkel, will be able to agree on dramatic reforms. The rise of the far-right, and other small parties, in Sunday's German election has made it tough for Merkel to form a government that commands a majority in parliament. 4. Earnings: Carnival (CCL) and Darden Restaurants (DRI) will release earnings before the open Tuesday, with Cintas (CTAS) and Nike (NKE) following after the close. Nike has been in the spotlight this week after it said it stood by NFL players who took a knee during the playing of the National Anthem. Shares in software firm Red Hat (RHT) are poised to surge by about 4% at the open after the company reported better-than-expected earnings on Tuesday. 5. Economics: There's a fair bit of economic data coming out Tuesday, including the S&P Case-Shiller home price index at 9 a.m. The U.S. Conference Board will report monthly consumer confidence data at 10 a.m. The U.S. Census Bureau will publish its August new home sales report at the same time. Fed chair Janet Yellen is making a speech at 12:45 p.m. in Cleveland. She's expected to cover topics including inflation, uncertainty and monetary policy.